AIO Boot uses Grub2, Clover or Syslinux and creating bootable media is quick and painless, despite the fact that there lacks proper English-language help. 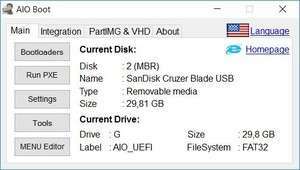 After AIO Boot has been downloaded, all you need to do is select the drive you'd like to work with, the pack (preset) you'd like to use (Windows, Linux, Antivirus, Backup, Disk Utilities, DOS or Android), the bootloader, etc. It should be noted that AIO Boot isn't necessarily the best option for novice users though some online tutorials explain usage in enough detail. Version 0.9.8.17 is a freeware program which does not have restrictions and it's free so it doesn't cost anything. For security reasons, you should also check out the AIO Boot download at LO4D.com which includes virus and malware tests. Additional screenshots of this application download may be available, too.